Mumbai: Priyanka Chopra, who is currently busy shooting for her Hollywood TV show ‘Quantico’, has found a best friend in her co-star Yasmine Al Massri. Ever since the show started, the two have been inseparable. From their lunch dates to spending a cosy day in at home, the BFFs, Priyanka and Yasmine often are spotted enjoying each other’s company. Priyanka not only shares a good equation with Yasmine but also his little baby boy Liam. 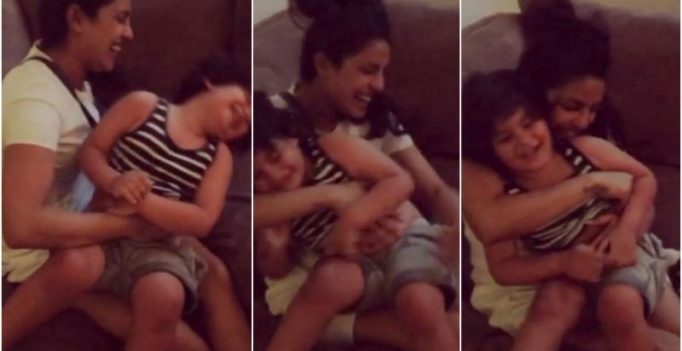 In a recent video shared by Yasmine, we see Priyanka Chopra cuddling Liam as the ‘two babies’ get out of control and share a light happy moment with each other. The adorable video shows a different side of Priyanka, who is an international sensation. Even Priyanka shared a cute video with Yasmine. “Friends for life.. @jazmasri major kisses #Quantico,” the actress captioned the video. Just few days back, the makers of ‘Quantico’ released their second season’s teaser. Priyanka Chopra, who is in NYC for ‘Quantico’, hasn’t yet announced new next Bollywood project. The actress is all set to make her big screen Hollywood debut with Dwayne Johnson’s ‘Baywatch’.